It snowed again in southern New Hampshire over the weekend – about five inches of slushy, heavy snow. The wintry early April day brought a flock of seven Cedar Waxwings to the garden. When they weren’t stripping the few remaining red berries from the holly shrubs, they were huddled in the Weeping Cherry tree. Today, it’s sunny and 60 degrees (F) at 4pm. The longer days of sunshine are quickly melting the latest – and hopefully last – blanket of snow. While most of the paths in the garden are still white and slippery, a swath of purple blooms caught my eye when I stepped onto my my front porch to get the mail. Spring has arrived! The crocus are blooming — just as expected in early April. It’s always a thrill to find the crocus in bloom. While expected, it always feels like the first flowers are a miracle. The garden still has a brown dormant winter appearance – from the decaying leaves, pine needles, and sticks that will eventually be picked up either by the birds building their spring nests or during the initial hours of our annual spring cleanup gardening day. While walking through the garden this afternoon, my soul filled with gratitude. Not just the sights of pops of bright color hear and there, but with the sounds of the songbirds who are out, searching for their spring mates. I felt caught between two seasons – winter because of the snow cover. And, spring with with the early blooming bulbs. I’d once read a quote about crocus that included the word Grace. That seems like the perfect way to end today’s story. Categories: Birds, Gardening Inspiration, Spring, Uncategorized, Winter | Tags: Cedar Waxwings, Crocus, Easter, Garden, Gardening, Grace, gratitude, Mother Nature, New Hampshire, NH, Scilla, Soul, Spring, winter | Permalink. 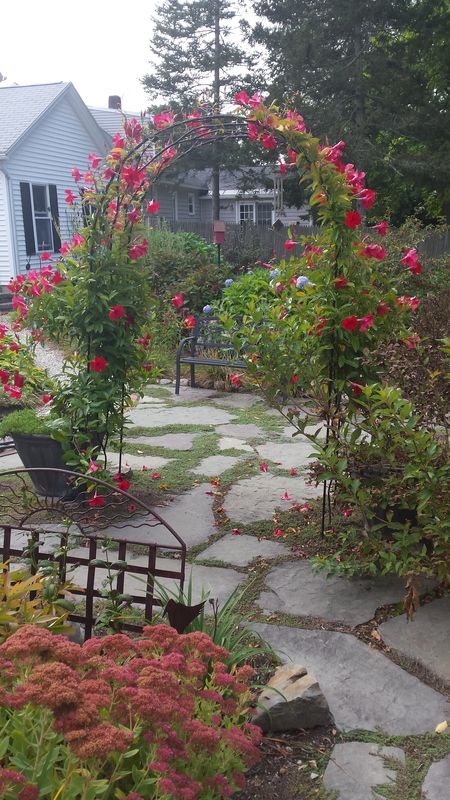 At the end of a very rainy day, I felt the need to stroll through my now fading garden. After a few minutes, I was feeling a little down that the flowers, especially the mandevilla, are starting to shrivel and drop after a very dry summer season. I heard a car pull up and stop on the other side of the hedge and could see a woman in the driver’s seat waving to me. We chatted for a few minutes about gardening and nature and peacefulness. It was an interaction that lasted only a few minutes. The irony hit me. I felt sad about the exact same thing that brought her joy. Before she left, we exchanged introductions. Her name is Grace. Categories: Autumn, Birds, Gardening Inspiration | Tags: fall, flowers, Gardening, Grace, mandevilla | Permalink. An important aspect of my garden is that it was planned to include a variety of plants to create interest all through the year. Just as the flowers are starting to fade, there are still some late season surprises popping up. It was an impulse purchase only because of the color of the berries and it is suited for zone 5. 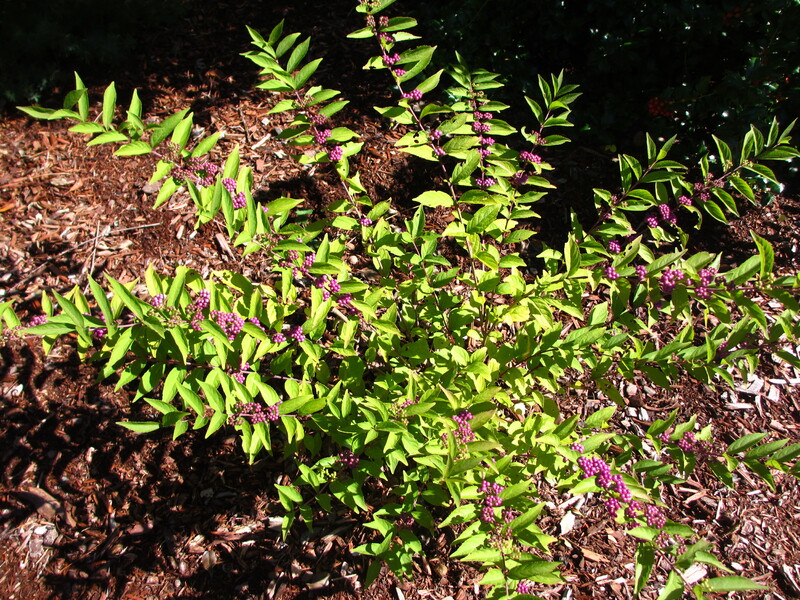 Before planting this little shrub in it’s permanent spot, it sat for a few days here and there in garden, so we could find the perfect spot to admire it the future. Honestly, with so much coming to an end in the garden the past few weeks, I forgot about this plant. It’s still small, about 2 feet in diameter. It will eventually get up to 4 feet tall and wide. We are starting to see a little color change since we’ve been fortunate that the temperature has only dropped to 36(F) degrees in the Nashua area so far this fall. And now, as we head into the middle of October, it is one of the most striking plants in the garden! But, take a closer look. I just think “WOW!” Its color is so unusual – personally, I think that the berries look fake because that color of purple is not normally seen in my garden. Even with the iris and day lilies. All of those bright purple berries are just beautiful. The birds enjoy these only when they exhaust the supply of other fruits and berries on the nearby holly and crabapples. It’s nice to have something so unusual and striking in the garden appear as the nights grow long, the days grow short, and time in the 2014 garden is quickly coming to an end. 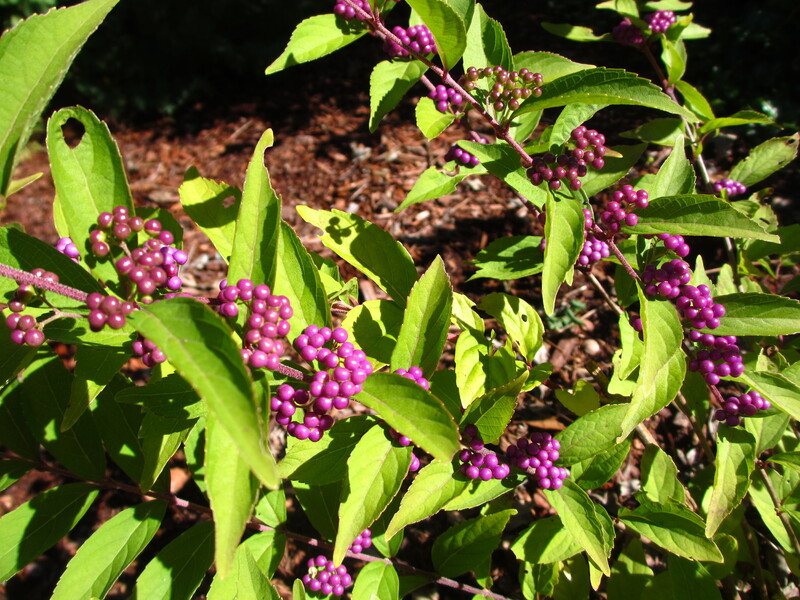 Categories: Birds, Gardening Inspiration | Tags: beautyberry, fall, Garden, purple | Permalink. Mother Nature does an excellent job to let us know that the seasons are changing in New England. The biggest hint that she offers is the changing color of the foliage across our region, with little flecks of red and yellow peeking out across a lush green landscape, sometimes as early as late August. 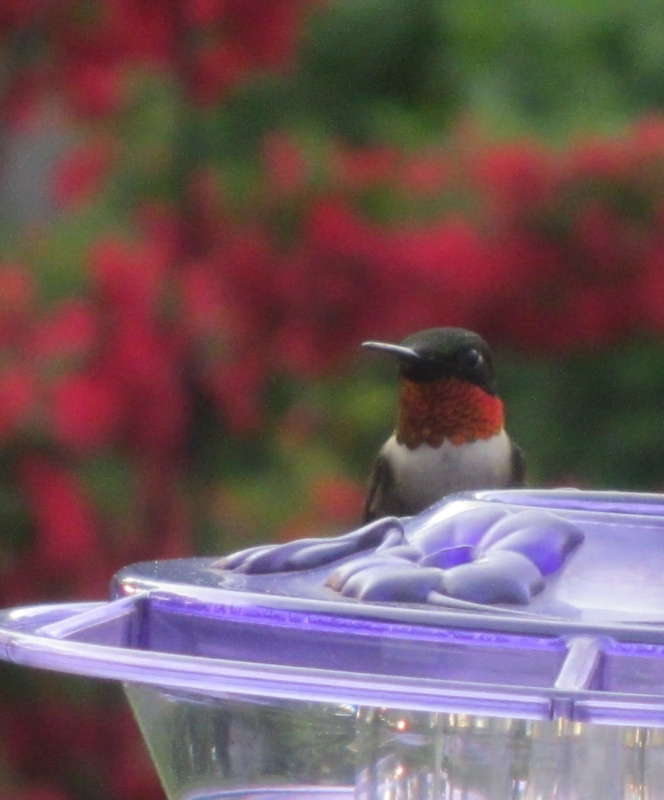 The other hint is the arrival and departure of the Ruby-Throated Hummingbirds to the garden. To me, this cue is more indicative of the transition from winter to summer and summer to winter than the changing trees. There is always so much anticipation in mid April when the hummingbird sugar water (we call it “Hummingbird Hooch”) feeders go up for the season. The arrival of the hummingbirds to the garden is a sign that the spring flowers including the lilacs and iris are starting to bloom. This summer, evenings on the back patio included the ritual of a daily “Hummingbird Watch” from 7:00-8:30pm each evening. It was the same, yet different every night. Different visitors would join this ritual but conversation would always stop (or at least tone down to a whisper) when the hummingbirds arrived. The males were very active and were the most frequent “hummingbird hooch” consumers during the early part of the summer. (The spectators of these birds would enjoy their own hooch, too! This summer’s favorite was the Garden Cucumber Cocktail or a refreshing. cold glass of Chardonnay or Sauvignon Blanc.) Here’s one of my favorite photos from June of a Ruby Thoated male that includes a red weigela in the background. 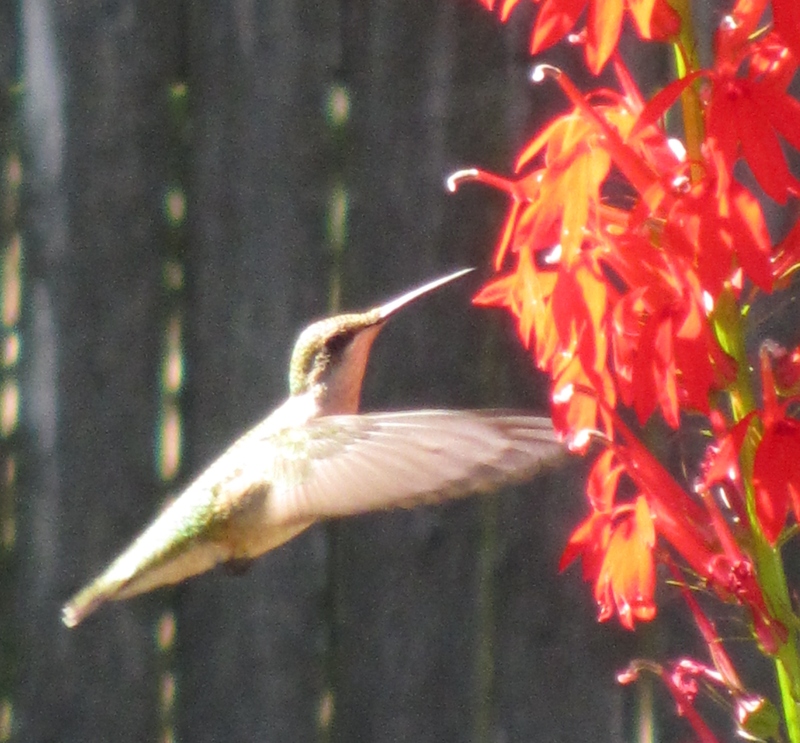 Finally, in early August, as I started to think about the pending departure of the this year’s resident hummingbird residents, a new perennial Cardinal Flower bloomed and attracted female hummingbirds all day long. I finally met my goal by capturing this shot. For as long as it seems to take for April to arrive each year, without fail, September always comes too quickly. This year was no exception. By late August the hummingbirds were ingesting 3x as much sugar water than they consumed between May and July. It was another cue that the summer season was about to change – these tiny powerhouses always need to fuel up before their long flights for their winter vacations in South America. By Labor day, the male Ruby-Throated birds were gone, headed south (probably to Costa Rica) to claim their winter territories and wait for their mates. By mid-September, the females were gone, too. The feeders are now empty and stored away until April 2015. It’s time to create a new daily garden ritual. Categories: Birds, Garden Rituals, Gardening Inspiration | Permalink.